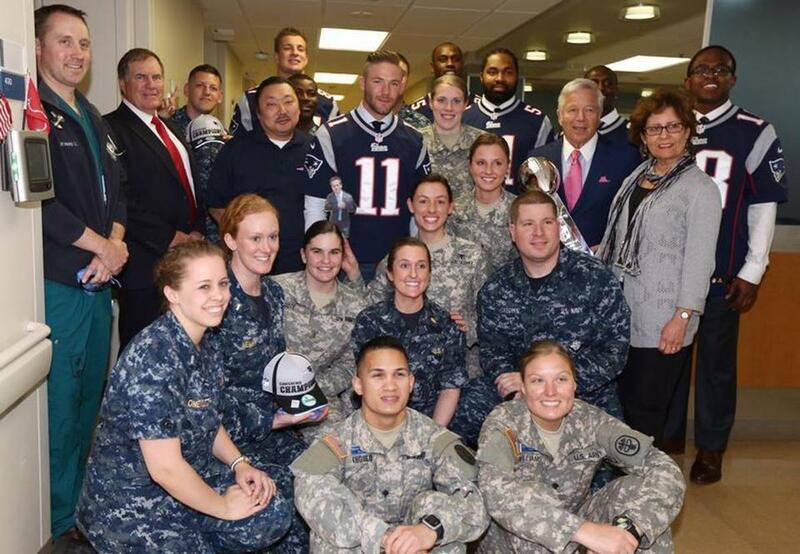 A contingent from the Patriots visited with military personnel at Walter Reed National Military Medical Center. 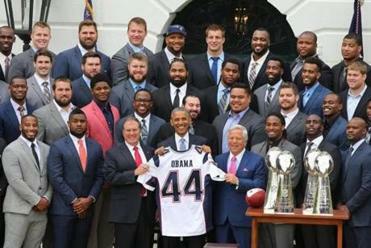 WASHINGTON — Thursday’s trip to the White House was certainly a lighthearted day of celebration for the Patriots. But it was also a day of poignancy and perspective for a few members of the organization. The Patriots were honored in front of the nation, but the people who really deserved the accolades were the combat veterans at Walter Reed National Military Medical Center in Bethesda, Md., who are recovering from lost limbs and broken bones suffered while serving our country in Afghanistan and Iraq. Kraft, Belichick, and six players — Julian Edelman, Devin McCourty, Chandler Jones, Jerod Mayo, Matthew Slater, and Gronkowski — flew down to Washington on a private plane early Thursday morning, separate from the rest of the team, to visit Walter Reed, one of the largest and most prominent military hospitals in the country. The Patriots wanted to bring the entire team, but narrowing it to a few select players ensured that the combat veterans would get plenty of quality one-on-one time with their favorite football players (and coach). The president’s remarks at a White House reception included a joke about Deflategate. The Patriots began this tradition after winning their first Super Bowl in the winter of 2002, and Thursday was Kraft’s and Belichick’s fourth such visit. Belichick grew up in the military culture as the son of a football coach at the Naval Academy in nearby Annapolis, Md., and Kraft has always felt an obligation to honor the military. The visit to Walter Reed lasted a little more than an hour — they wanted to stay longer, but Obama keeps a tight schedule — but it served as an important dose of perspective for the Patriots involved, and helped remind them that things are pretty good in civilian life. The Patriots divided into two groups — Kraft leading one, Belichick leading the other — to meet as many soldiers as possible. They met soldiers missing limbs, soldiers recovering from massive head trauma, and several troops in various stages of recovery in the Wounded Warrior Project. They also met a lot of Patriots fans. Perhaps the most touching moment came when the Patriots presented a football autographed by the entire team to a combat veteran who happened to be a diehard Seahawks fan, of all things. The Seahawk fan watched the Super Bowl in the wee hours of the morning from Afghanistan with his buddy, a medic named John Dawson who was a diehard Patriots fan from Whitinsville, Mass. Dawson has since been killed in action. The Seahawk fan asked for a Patriots autographed football so he could present it to Dawson’s family. Thursday was not a day to ask Revis about the awkwardness of leaving his teammates for the rival Jets or the inflammatory comments about Belichick and Tom Brady he possibly made on Instagram (he said he was hacked). It was not the day to ask Belichick about his plans at cornerback, or Jerod Mayo about his new pay cut, or Dont’a Hightower about his rehab from shoulder surgery. It was a day to celebrate the Patriots, and honor the soldiers who allow us to enjoy the Patriot victories.